WikiLeaks is ready to sue Britain’s Guardian newspaper for a “fabricated Manafort story” that accused Julian Assange of secretly meeting Donald Trump’s former election campaign chairman Paul Manafort. Manafort agreed to take part in the Mueller probe over Russia’s alleged meddling into the 2016 US election but he denies co-operating with Russia or ever meeting Assange. The author of the report, Luke Harding, based his claim on “sources” and a document “written by Ecuador’s Senain intelligence agency and seen by the Guardian,” which the newspaper didn’t publish. “Why not show CCTV? London is the most heavily surveilled places on Earth. Why not show that? Why rely on a single Ecuadorian source who appears to be an Ecuadorian intelligence source with the MI6 on the other hand of the line and the US on the other?” he said in a comment to RT. “Many people might have read this story and seen some commentary about it and news on CNN and judge that Assange did meet with Paul Manafort,” he pointed out. Although WikiLeaks is going to sue over this story and both WikiLeaks and Paul Manafort deny the allegations, the article is still on The Guardian’s website. “It is a sad commentary on what The Guardian has become – basically a bulletin board for fabricated national security state propaganda,” Blumenthal said. According to the journalist, this story brings together the Russiagate scandal in Washington with the plot to extradite Assange. “We know that there is an indictment of Julian Assange, it may be made public tomorrow,” he said. US Secretary of State Mike Pompeo met with the Ecuadorian foreign minister earlier in the week, which might be a sign that it could be made public, Blumenthal explained. 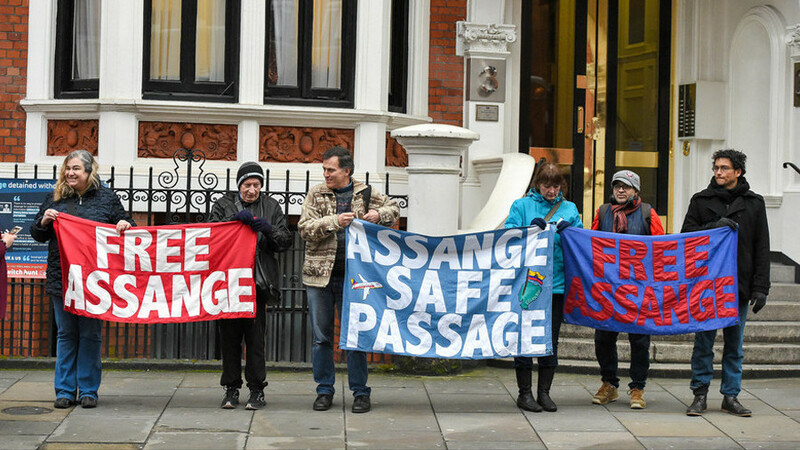 “This apparently fabricated story was planted through Luke Harding… in order to lay the case for the arrest and extradition of Julian Assange,” he said. ALSO ON RT.COMAll the Kremlin’s men: Farage, Moscow and six degrees of Kevin BaconFormer MI5 intelligence officer Annie Machon thinks the US will go to any lengths to fix charges against Assange. “It has been an open secret for many years that there has been a secret grand jury convened in Virginia trying to find any charge or probably make up a new law just to prosecute Julian Assange as a revenge for the fact that he shone a very bright light on some very murky and dark details of what the American state was doing,” she explained.